Microsoft has released its much awaited Windows 7 Service Pack 1. 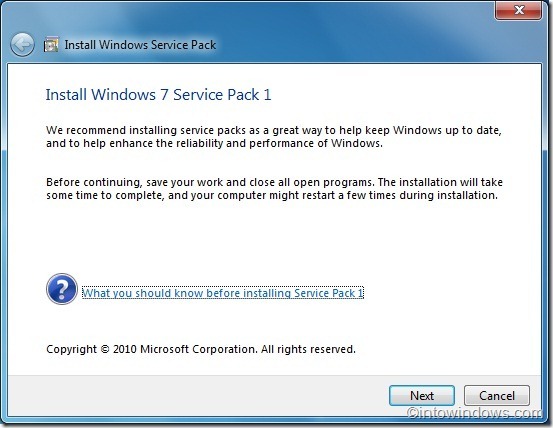 Now users can Download Windows 7 Service Pack 1 live from Microsoft here. One Week ago, Windows 7 Service Pack 1 and Windows Server 2008 R2 became available for MSDN/TechNet subscribers. Windows 7 SP1 only contains two major new features, which will not affect the majority of users. The first of the two is RemoteFX, a standalone product that requires Windows Server 2008 R2 to be used. RemoteFX allows users to watch high-quality video and interact with 3D applications over a remote desktop session -- this will change the way Virtual Machines are used, as they have had limited display capabilities until now. The second feature is an update for HyperV in Windows Server 2008 R2 called "Dynamic Memory". The feature is as simple as it sounds -- it dynamically allocates memory to virtual machines as required and is able to remove memory from virtual machines when others need higher resources. You can read more about the new features over on the Windows Server Team Blog. Download Windows 7 Service Pack 1 Now ..! !